By: Crawford Howell Toy, Wilhelm Bacher, Executive Committee of the Editorial Board. An alphabetical list of all the words in a book, with references to the passages where each word is found. The appellation indicates the concordance or similarity of all such passages. In Jewish literature the term is applied exclusively to concordances of the Bible and of the Talmud. The word, in this connection, was first used by Hugo de Sancto Caro (named from Saint-Char, a suburb of Vienne in southern France), who compiled a concordance to the Vulgate about 1244. The revised edition of this work, made by the Franciscan Arlotto di Prato (Arlottus), about 1290, served as a model for the concordance to the Hebrew Bible which Isaac Nathan b. Kalonymus, of Arles in Provence, compiled 1437-45. Isaac Nathan, also known as the author of Biblio-exegetical and religio-philosophical works, was led to undertake this task by discovering, during the polemic discussions forced upon him by Christian scholars, that, in order to refute the arguments drawn by his opponents from the Bible, it was necessary to have an aid that furnished a ready reference to every Biblical passage and a quick survey of all related passages. He called his concordance "Meïr Natib" (Enlightener of the Path); on the title-page of the first edition, however, it is also called "Yaïr Natib" (It Will Light the Path, after Job xli. 24 [A. V. 32]). This work, on which all later Hebrew concordances were based, is the first Jewish work in which the original text of the books of the Bible is divided into chapters, and these and the verses are numbered according to the Vulgate. Isaac Nathan also found it necessary to add to his preface a list of the first words of each chapter. He followed the Vulgate in the sequence of the Biblical passages, keeping the order of the books of the Bible as found therein. Isaac Nathan's concordance was first published by Bomberg at Venice in 1523, this edition being followed by several others (Venice, 1564; Basel, 1556, 1569, 1581). The first Basel edition has a Latin translation of the principal words. An enlarged edition, containing a concordance to the Aramaic parts of the Bible and an index of Biblical proper names, places, etc., was undertaken by Marius de Calasio at Rome 1621. Other editions appeared at Cologne, 1646; London, 1647-49; and Rome, 1657. 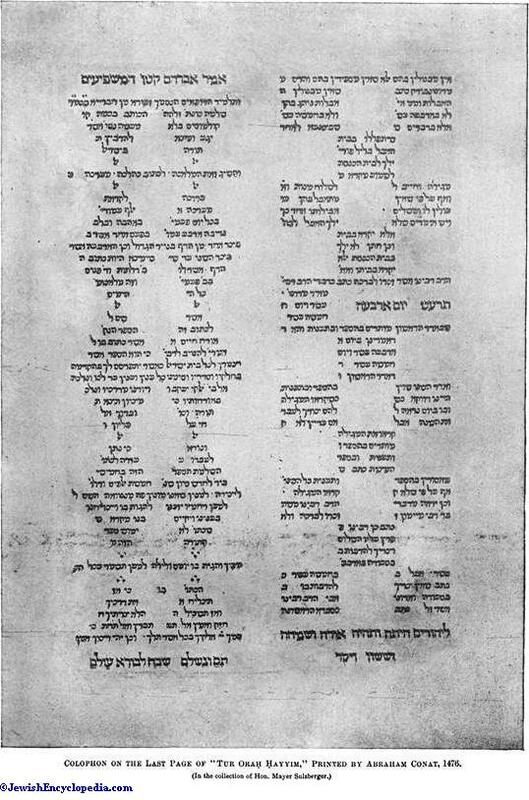 Even before Isaac Nathan's work was printed Elijah Levita of Rome began to work out a concordance on a Masoretic basis, which he at first intended to entitle "Sefer Beḳi'ut" (Book of Scholarship), but afterward called "Sefer Zikronot" (Book of Remembrance), indicating thereby its function as an aid to the memory. The manuscript of the first draft—probably by the author himself—finished between 1515 and 1521 and dedicated to Cardinal Ægidius of Viterbo, is now in the Royal Library at Munich (Steinschneider, "Die Hebräischen Handschriften der Königlichen Hof und Staatsbibliothek in München," No. 74; "Joodsche Letterbode," vii. 174). The manuscript of the second draft, finished at Venice 1536, is in the Bibliothèque Nationale, Paris (Frensdorff, in Frankel's "Monatsschrift," xii. 101). 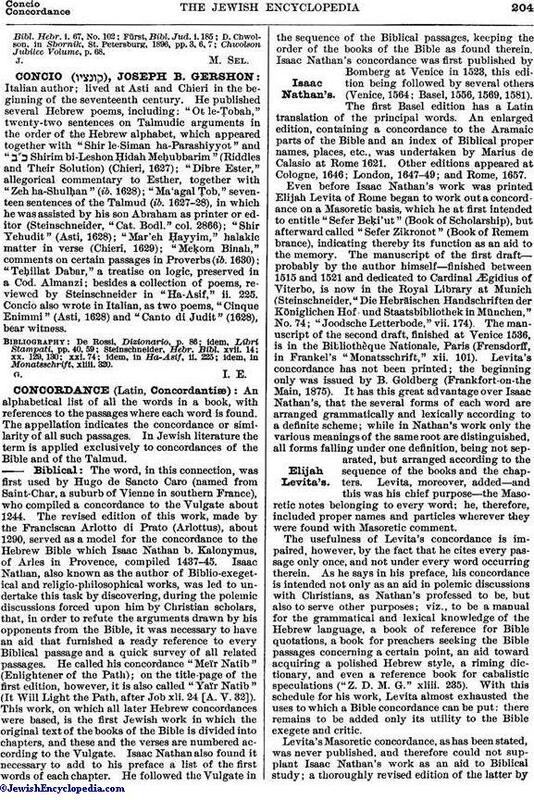 Levita's concordance has not been printed; the beginning only was issued by B. Goldberg (Frankfort-on-the Main, 1875). It has this great advantage over Isaac Nathan's, that the several forms of each word are arranged grammatically and lexically according to a definite scheme; while in Nathan's work only the various meanings of the same root are distinguished all forms falling under one definition, being not separated, but arranged according to the sequence of the books and the chapters. Levita, moreover, added—and this was his chief purpose—the Masoretic notes belonging to every word: he therefore, included proper names and particles wherever they were found with Masoretic comment. The usefulness of Levita's concordance is impaired, however, by the fact that he cites every passage only once, and not under every word occurring therein. As he says in his preface, his concordance is intended not only as an aid in polemic discussions with Christians, as Nathan's professed to be, but also to serve other purposes; viz., to be a manual for the grammatical and lexical knowledge of the Hebrew language, a book of reference for Bible quotations, a book for preachers seeking the Bible passages concerning a certain point, an aid toward acquiring a polished Hebrew style, a riming dictionary, and even a reference book for cabalistic speculations ("Z. D. M. G." xliii. 235). With this schedule for his work, Levita almost exhausted the uses to which a Bible concordance can be put: there remains to be added only its utility to the Bible exegete and critic. 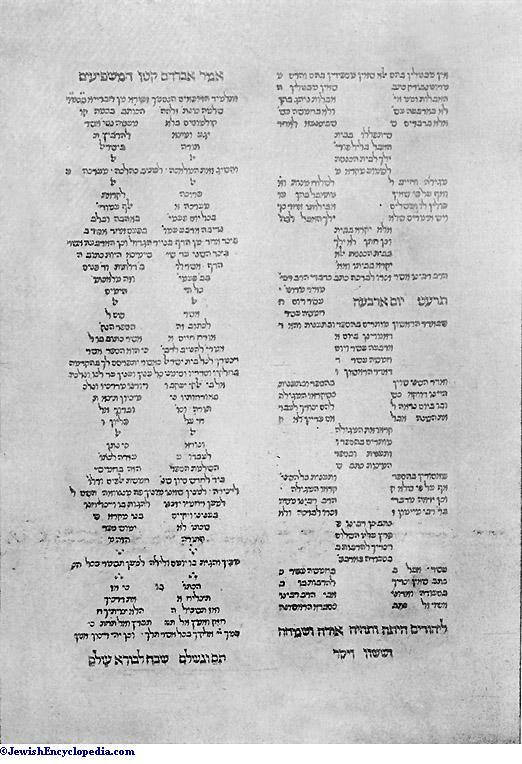 Colophon on the Last Page of "Ṭur Oraḥ Ḥayyim," Printed by Abraham Conat, 1476. Levita's Masoretic concordance, as has been stated, was never published, and therefore could not supplant Isaac Nathan's work as an aid to Biblical study; a thoroughly revised edition of the latter by the eminent scholar Johann Buxtorf the Elder of Basel became the concordance par excellence. Buxtorf followed Nathan's work closely; he retained the latter's remarks on the meanings of the root placed at the head of every article, but also gave these in Latin, and explained every form of the word in Latin. He materially increased the usefulness of the concordance by separating from one another the derivatives of a root, the nominal and the verbal forms, and by arranging them systematically, as Levita had done. Buxtorf's concordance appeared after his death (Basel, 1632), his son Johann adding to it a concordance of the Aramaic portions of the Bible as well as a long preface. This concordance, which was authoritative for more than two hundred years, was reedited by John Taylor, London, 1754. Extracts from it were made by Christian Ravius, Frankfort-on-the-Oder, 1676, and by Andreas Sennertus, Wittenberg, 1653. A most useful and important addition to it was made by Christian Nolde (Noldius) in his "Concordance of the Particles," Copenhagen, 1679; new ed., Jena, 1734. A highly valuable revision of the concordance was undertaken by Julius Fürst. In the Latin preface to his great work (Leipsic, 1840) he described the relation of the latter to Buxtorf's concordance in the following words: "I admit that I have used Buxtorf's concordance as the foundation for my own work; but I may claim that I have not only revised and enlarged Buxtorf's work, but have worked it over to such an extent that I do not hesitate to affix my name to the concordance. I have enriched Buxtorf's work with many additions; adding, for instance, Wolf Heidenheim's manuscript notes contained in his copy of the book, and articles that Buxtorf had omitted, as on the verb and the divine name Yhwh. All these additions are in accordance with the advances in philology, and especially in etymology; and in some cases I have followed an entirely new arrangement, founded upon a careful examination of the origin and the form of the words." Fürst added new material, and made some minor changes, especially by substituting Arabic numbers for the quotations instead of the Hebrew letters. The headings of the articles are entirely new, having been transformed into interesting lexicographical articles in which the etymology and meaning of the root are explained by the aid of comparative philology. Unfortunately, however, Fürst goes too far in applying his theory of the primitive roots of the Semitic languages and of the original relationship of the latter with the Indo-Germanic languages. This theory had been propounded by Fürst's pupil, Franz Delitzsch, in his work "Jesurun" (Grimma, 1838), which was designated as "Prolegomena to Fürst's Concordance of the Old Testament." Fürst's peculiar views on certain Hebrew roots affected unfortunately the arrangement of the concordance, as he often places a word in a connection in which it would not be sought according to the commonly accepted view; as, for instance, ("blood") under the root ("man"). The work has a number of interesting appendices, including: an etymologic index to the concordance; an alphabetical list of 2,668 Biblical proper names, with their etymologies, but without reference to the passages; a list of about 600 Phenicio-Punic proper names; an index of Aramaic and Neo-Hebrew words compared in the headings to the articles; an etymological table of Hebrew and Aramaic particles; a systematic view of the noun forms; "Propylæa Masoræ," a view of the most important topics of the Masorah; a synopsis of the history of the Hebrew language, written in Hebrew; and a comparative glossary of Hebrew, Aramaic, Syriac, and Arabic words. In the "Litteraturblatt" of the periodical "Der Orient," edited by Fürst, additions and revisions to the concordance repeatedly appeared in the years following 1840. B. Bär issued a new edition of Buxtorf's concordance—in quarto instead of in folio—making use in part of Fürst's work (Stettin, 1862, et seq.). An English version by B. Davidson appeared in London in 1876. An entirely new revision of the concordance was undertaken a few years ago by Solomon Mandelkern. He had found, after a thorough examination of the entire material, that "in the concordances of Fürst and Bär about 5,000 omissions and grammatical errors, as well as countless misquotations and wrong references, must be rectified." 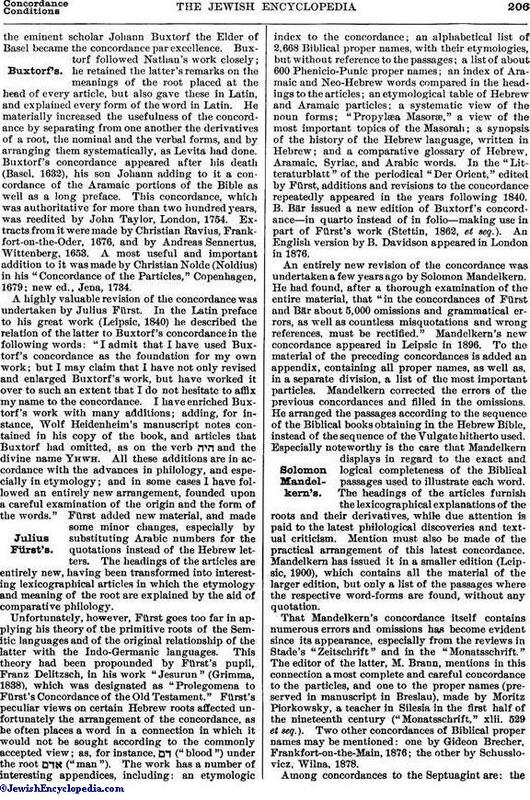 Mandelkern's new concordance appeared in Leipsic in 1896. To the material of the preceding concordances is added an appendix, containing all proper names, as well as, in a separate division, a list of the most important particles. Mandelkern corrected the errors of the previous concordances and filled in the omissions. He arranged the passages according to the sequence of the Biblical books obtaining in the Hebrew Bible, instead of the sequence of the Vulgate hitherto used. Especially noteworthy is the care that Mandelkern displays in regard to the exact and logical completeness of the Biblical passages used to illustrate each word. The headings of the articles furnish the lexicographical explanations of the roots and their derivatives, while due attention is paid to the latest philological discoveries and textual criticism. Mention must also be made of the practical arrangement of this latest concordance. Mandelkern has issued it in a smaller edition (Leipsic, 1900), which contains all the material of the larger edition, but only a list of the passages where the respective word-forms are found, without any quotation. That Mandelkern's concordance itself contains numerous errors and omissions has become evident since its appearance, especially from the reviews in Stade's "Zeitschrift" and in the "Monatsschrift." The editor of the latter, M. Brann, mentions in this connection a most complete and careful concordance to the particles, and one to the proper names (preserved in manuscript in Breslau), made by Moritz Piorkowsky, a teacher in Silesia in the first half of the nineteenth century ("Monatsschrift," xlii. 529 et seq.). 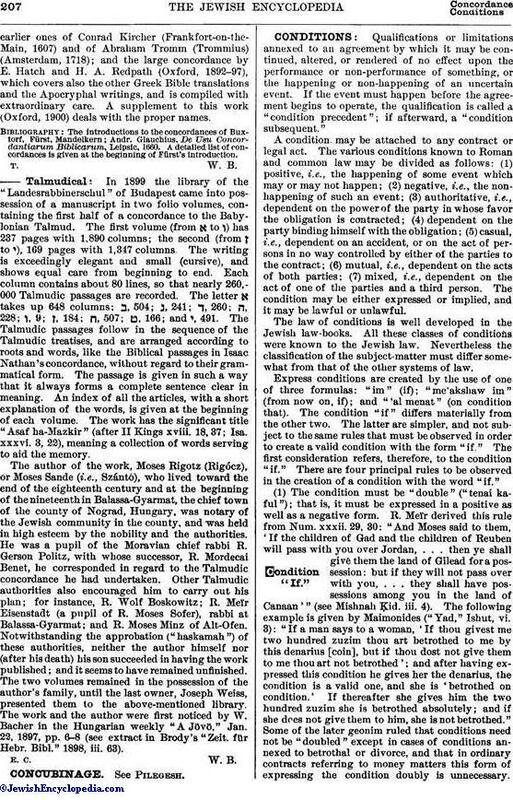 Two other concordances of Biblical proper names may be mentioned: one by Gideon Brecher, Frankfort-on-the-Main, 1876; the other by Schusslovicz, Wilna, 1878. Among concordances to the Septuagint are: theearlier ones of Conrad Kircher (Frankfort-on-the-Main, 1607) and of Abraham Tromm (Trommius) (Amsterdam, 1718); and the large concordance by E. Hatch and H. A. Redpath (Oxford, 1892-97), which covers also the other Greek Bible translations and the Apocryphal writings, and is compiled with extraordinary care. A supplement to this work (Oxford, 1900) deals with the proper names. Andr. Glauchius, De Usu Concordantiarum Biblicarum, Leipsic, 1660. A detailed list of concordances is given at the beginning of Fürst's introduction. In 1899 the library of the "Landesrabbinerschul" of Budapest came into possession of a manuscript in two folio volumes, containing the first half of a concordance to the Babylonian Talmud. The first volume (from א to ו) has 237 pages with 1,890 columns; the second (from ן to ו), 169 pages with 1,347 columns. The writing is exceedingly elegant and small (cursive), and shows equal care from beginning to end. Each column contains about 80 lines, so that nearly 260,000 Talmudic passages are recorded. The letter א takes up 648 columns; ב, 504; ג, 241; ד, 260; ה, 228; ו, 9; ן, 184; ח, 507; ט, 166; and י, 491. The Talmudic passages follow in the sequence of the Talmudic treatises, and are arranged according to roots and words, like the Biblical passages in Isaac Nathan's concordance, without regard to their grammatical form. The passage is given in such a way that it always forms a complete sentence clear in meaning. An index of all the articles, with a short explanation of the words, is given at the beginning of each volume. The work has the significant title "Asaf ha-Mazkir" (after II Kings xviii. 18, 37; Isa. xxxvi. 3, 22), meaning a collection of words serving to aid the memory. The author of the work, Moses Rigotz (Rigéez), or Moses Sande (i.e., Szántó), who lived toward the end of the eighteenth century and at the beginning of the nineteenth in Balassa-Gyarmat, the chief town of the county of Nograd, Hungary, was notary of the Jewish community in the county, and was held in high esteem by the nobility and the authorities. He was a pupil of the Moravian chief rabbi R. Gerson Politz, with whose successor, R. Mordecai Benet, he corresponded in regard to the Talmudic concordance he had undertaken. Other Talmudic authorities also encouraged him to carry out his plan; for instance, R. Wolf Boskowitz; R. Meïr Eisenstadt (a pupil of R. Moses Sofer), rabbi at Balassa-Gyarmat; and R. Moses Minz of Alt-Ofen. Notwithstanding the approbation ("haskamah") of these authorities, neither the author himself nor (after his death) his son succeeded in having the work published; and it seems to have remained unfinished. The two volumes remained in the possession of the author's family, until the last owner, Joseph Weiss, presented them to the above-mentioned library. The work and the author were first noticed by W. Bacher in the Hungarian weekly "A Jövö," Jan. 22, 1897, pp. 6-8 (see extract in Brody's "Zeit. für Hebr. Bibl." 1898, iii. 63).